Our volunteers do more than just handle calls. We recently participated in this island-wide drill, and utilized our rescue swim skills and surplus acquired humvee vehicles to successfully transport the “victims” off of the beach to awaiting ambulances. Thanks for your support, we’re always here to assist the community! Thanks for the coverage, The SandPaper ! Practice makes perfect, and that was the goal of a mutual aid drill involving multiple swimmers in distress on Surf City’s Fourth Street beach earlier this month. Adding to the authenticity of the drill were the staggered response times to the event to test the real-life challenges that face fire and first aid companies on the Island, especially in summer. The drill was a joint training exercise with Barnegat Light, Beach Haven, and Ship Bottom’s volunteer fire companies. 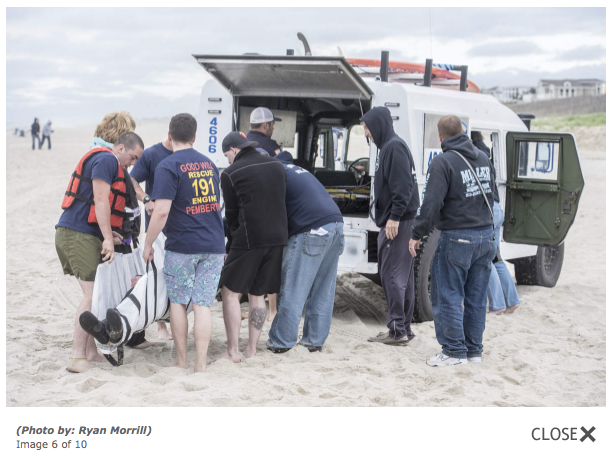 Barnegat Light and Beach Haven first aid squads also participated, as did the Surf City police department and Goodwill, Surf City Volunteer Fire Co. Chief Mike Wolfschmidt said. In total, more than 50 volunteers participated. “I put it together because throughout the spring, summer, and early fall our company is frequently requested for swimmers in distress when the beach patrol is off duty,” Wolfschmidt said. In real life, Barnegat Light and Beach Haven fire companies are automatically called to any water-rescue event because they have teams trained specifically for water rescue, he said. They participated in the June 8 drill along with the Ship Bottom Volunteer Fire Co., which has several firefighters who are rescue swimmers and two military-style Humvees that can transport patients off the beach, Wolfschmidt said. 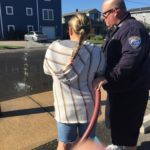 The scenario for the June 8 drill included five swimmers in distress in the rough surf off the Fourth Street beach in the borough, he said. 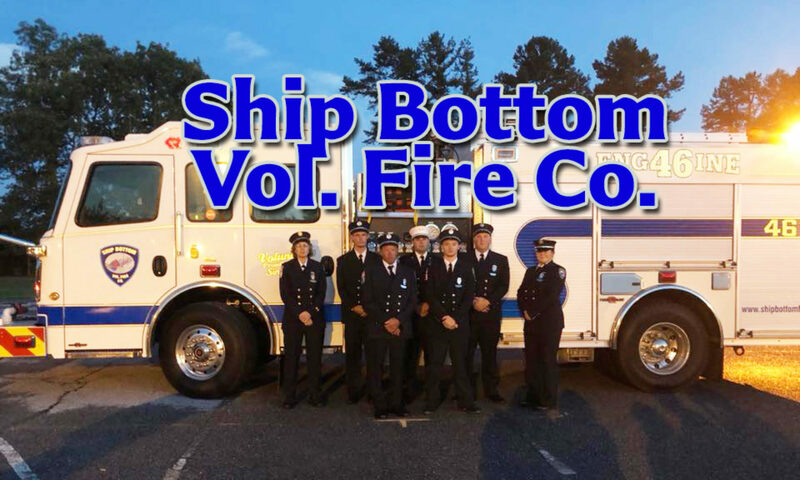 Ship Bottom Fire Co. rescue swimmers, equipped with lifeguard cans, were the first in the water and made contact with the victims. They kept them afloat until the Barnegat Light Volunteer Fire Co. responded with its Jet-Skis, and Beach Haven rescuers could safely bring them to shore, Wolfschmidt said. Like real-life situations, the drill included a twist: Toward the end, a CPR dummy dressed in a wetsuit was dropped facedown on the beach to simulate a rescue swimmer suddenly going into cardiac arrest, Wolfschmidt said. Wolfschmidt called the drill “a positive learning experience.” During the post-event debriefing, participants discussed best practices and lessons learned to improve upon future rescues, both real and in training scenarios. 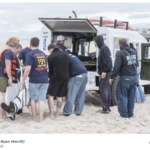 That weekend, June 9-11, Island volunteer first-responders answered three water-rescue calls, according to Bob Selfridge, a lieutenant with the Barnegat Light First Aid Squad. 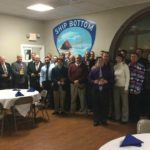 He said water rescue calls account for about 25 percent of calls for the Barnegat Light First Aid Squad, with many coming in early spring or the fall when lifeguards are not on duty. Still, it can happen in the summer after hours, he said. Selfridge said people come down on a Friday, and around 6 p.m. they decide they want to go for a swim. The trouble is the beaches are guarded from 10 a.m. to 5 p.m. throughout most Island communities. 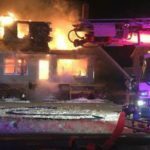 Having a great working relationship with neighboring fire and first aid squads is a big part in achieving that priority, he said. “It provides the public with the best service possible,” Wolfschmidt said, noting Surf City has a great relationship with all the fire and first aid squads on the Island and in Stafford Township.